Original SipSnap TOT universal silicone sippy cup lid by Double Double. A perfect mealtime companion. Your child learns to drink from real cups while you get a little bit of extra peace. This universal sippy cup lid can be stretched over any cup to provide a convenient, at home, or on the go, spill-proof kids' drinking vessel. 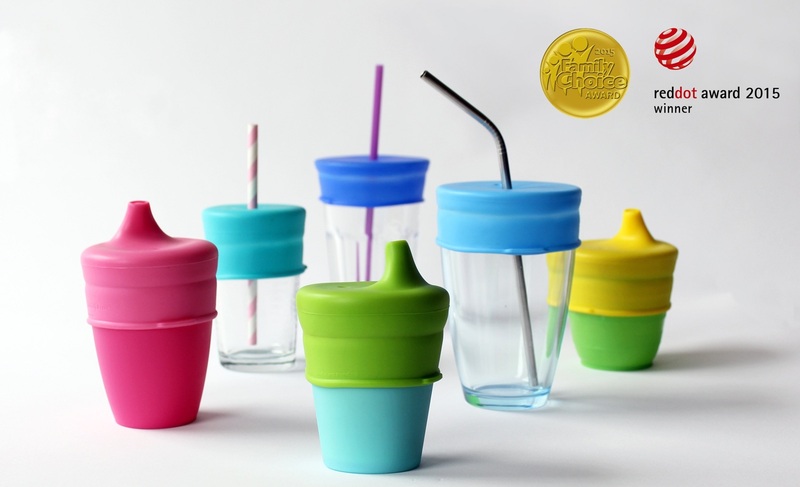 SipSnap TOT is perfect for the younger ones transitioning from bottles. Use the cups you already own and gain more control over what material your child drinks from. Each set comes with three SipSnaps and a case. Stretches over all cup sizes. Made of high quality LFGB approved food grade silicone. BPA, phthalate, and latex free. Gives you more choice over the material your child drinks from. Roll-stop bumper so your tipped cup doesn't go far. Dishwasher safe and boil safe for sterilization. Folds and stacks for compact storage. Environmentally responsible — use the cups you already own. Comes with a case so you can easily take it along on small and big trips. Great to use at restaurants and parties. Red Dot Award and Family Choice Award winner for 2015. Toddlers and young children transitioning from bottles. Also work great for the handicapped, elderly, or anyone with fine motor difficulty.